Ordination is granted by the Board of Directors of the All Faiths Church of Spirituality and Health, Inc. to those who meet the criteria. Board members and Faculty of Holos University Graduate Seminary are carefully vetted prior to appointment to Boards or Faculty and are eligible for Ordination with no prerequisite requirements. Students and Graduates have prerequisite requirements. Please select the appropriate category from the list below. Recommendation Requirement: This application must be accompanied by a letter of recommendation from a HUGS Faculty Member. This letter may be uploaded via this form or sent to the Registrar at Registrar@HolosUniversity.org. Completion of the following courses is required for Ordination. Please check the boxes below of the courses you have completed or for which you have been granted equivalency credit by the Academic Review Committee. 715-Ethics; 755-Holistic Theology World Religions; or 752-Mysticism-Ancient to New Thought; and 887-Sacred Ceremonies and Celebrations. Recommendations: 887-Sacred Ceremonies and Celebrations is highly recommended for those who plan to act as Celebrants for Sacred Ceremony and Celebrations such as Marriages, Memorials and other key markers in life. 6. We believe in Love, Compassion, and Honor that we may heal ourselves, the Earth and each other. Members and Ordained Ministers of the Church are encouraged to follow their own core religious and noetic* beliefs, using the tenants of this Church as a Ministry to provide avenues for the comprehensive integration and understanding of Spirituality and Health within all Faiths. 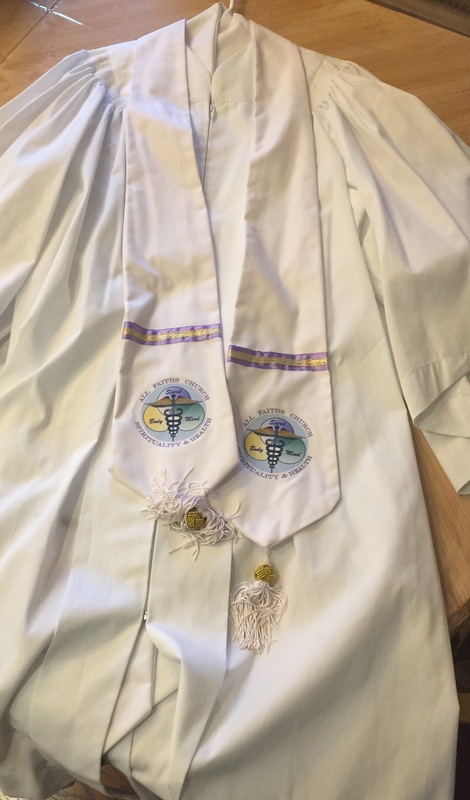 Students must submit this completed application by the deadline posted on the HUGS website calendar along with payment of the ordination fee, which includes the gown and stole. All persons to be Ordained must be present at an Ordination Ceremony (location is posted on the HUGS website Calendar). If you have a problem working with this form, please call Louise at 888-272-6109x2.